Editor’s Introduction: In this week’s Magic Oddica TheMisprintGuy shares a type of misprint that was only found in one set, that harkens back to the earliest days of Magic – Alpha. Check out Chapter XII of Keith Adams‘ Magic Oddica to learn all about these unique collectibles! In 1995, Wizards of the Coast released its new reprint set, known as 4th Edition. Being almost two full years since the introduction of their first set, Limited Edition Alpha, Wizards had established how new cards were to look. In this case, I am referring to how each cards were cut. Wizards had since abandoned Alpha’s more rounded corners in favor of the rounded corners still used today. Alpha stands alone in it’s look and cut. However, a small amount of commons and uncommons from the 4th Edition set were mistakenly produced using the original Alpha cut. Rares and basic lands were not given this treatment, but every example of the commons and uncommons are available and officially released – mistakenly – into packs. With the exception of a small amount of rares that were cut and packaged into Beta starters (making them look EXACTLY like Alpha cards), these Alpha cut 4th Edition cards are the only other cards given this treatment. I haven’t been able to find an answer as to how or why something like this happened in the first place. Seemingly, it wouldn’t be difficult to change the cutting press to change the corners on cards to produce a different look for these cards. However, truly anyone with a good steady hand and a sharp knife or specialized cutting device could produce these cards. It is for this reason that the misprint community has not embraced these errors as much as other rarities. The value has remained relatively low, as the likelihood of forged misprints remains high. I own a few of these mostly as examples, not pressing to get plenty simply for that reason alone. 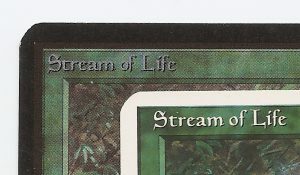 In the scans I have provided, I show you a closeup of both a common and uncommon Alpha cut 4th Edition card as well as a true Alpha card below it for comparison. These incorrectly cut cards may give you a good reason to revisit your card collection again to see what just might be hiding in it!